My parents can't get enough of me! 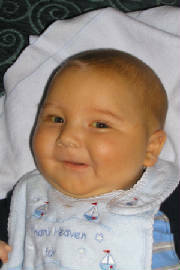 Baby Mark flew to heaven on December 22, 2004. We continue to maintain his website to help other families facing the same challenges that we did and spread Marky's message about the critical need for organ transplants for children and adults. I need a liver, small intestine and kidney transplant. The first day of my life the doctors had to remove my small intestine because it became twisted before I was born. Other than that, everything else was in perfect condition. I will only survive through the thoughtfulness of someone who I'll probably never know, someone like you. It's terribly sad, but I need a Mom or a Dad who has just lost their precious baby to give me the gift of life through organ donation. Sometimes I find my mom crying and she tells me she's crying for the family of my future donor. We will never be able to thank them for their gift of life. 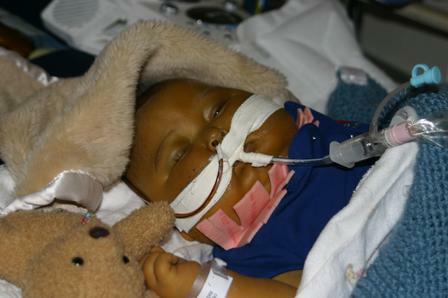 Today, there are not many children's organs available because not all available organs are donated--50% of those on the waiting list do not receive an organ in time. My guess is because it is difficult to consider that sort of decision when parents are grief stricken with their loss. Without a small intestine, none of us can absorb any nutrition into our bodies. So, I need a small intestine transplant so some day I can eat normally. Also, I need a liver transplant at the same time because, when you don't have a small intestine and you're on an IV for nutrition your liver starts failing too. Doctors haven't been able to figure out why that happens. Maybe someday when I grow up I'll figure it out. I need a kidney transplant because my kidney's have been damaged either from all of the antibiotics I've needed or decreased blood flow caused by my failing liver, the doctors just don't know. Until I get my new organs, my body gets food through a tube that goes directly into my blood stream. I also drink a bottle with formula like any other baby, so I can learn to eat through my mouth. But, the formula leaves my stomach through another tube. Happy Birthday to my cousin Carly Bodensteiner. She is 18 today. I hope she has a happy birthday. This is my final entry (although my Mommy may continue her journal for a while). After 10 weeks in the hospital and 9 1/2 weeks at the top of the list, the doctors came to Mommy and Daddy yesterday and told them that my little body just wasn't serving me anymore. I was trying to tell everyone that I was ready to be an angel in heaven and see my Grandpa Joe. At 11:24pm last night I flew to heaven. I was sleeping in my Daddy's arms surrounded by Mommy, Aunt Lisa, Ben and Sarah. Grandma Joan and Mary Cate came up earlier to say goodbye to me too. I know this will be hard on Mommy and Daddy and everyone else but I am much happier today than I was yesterday. My little body was just too tired to continue. Mommy and Daddy offered my heart for donation as it was the strongest part of me. Because of the medication I'd been on and the length of my hospitalization, it was determined that my little heart wouldn't be the best for another little fighter. I met so many wonderful medical professionals during my short life. I want to thank everyone who helped me at Valley Hospital, Drs. Kntusen, Gervasio, Perlin & Kapler, Sunrise Hospital in Las Vegas, Dr. Kim LaMotte & everyone at Desert Valley Pediatrics, Dr. Howard Baron & everyone at Pediatric Gastroenterology and Nutrition Assoc., Dr. Nick Fiore & everyone at Center for Children's Surgery and all of the rest of my Las Vegas medical team. Finally, a big thank you to everyone at UCLA, Dr. Doug Farmer, Dr. Sue McDiarmid and all of the many doctors, nurses, technicians and staff who cared for me. We met so many wonderful people that tried so hard to make me all better and give comfort to Mommy and Daddy. I will see you all in heaven! We love reading all of the entries into our guest book. Thank you so much. Many people have asked my mom and dad what they can do to help. One thing you can do is talk to everyone you know about organ donation and become a donor. My parents believe that if people are educated and consider organ donation before a horrible time in their lives, more might give the gift of life. They also want me to tell you about a new foundation we just learned about. It's called The Second Chance Foundation it has been established to educate the public about the importance of organ and tissue donation as well as raise funds to help those in need of or who have had transplants. You can visit their web site at www.secondchancefdn.org, email them at info@secondchancefdn.org, call 702-369-5876 or send a donation to: 2069 E. Sahara Ave., Suite B, Las Vegas, NV 89104.